Playa Paraiso is a new development of a few hundred mostly low rise town houses and bungalows. The photo above, which shows the eastern part of Playa Paraiso, was taken looking across the salt beds, with the hills of the Calblanque nature reserve in the background. The western end of the development (off to the right) consists of several similar looking blocks plus a few two and nine storey apartment buildings (Villa Cristal). It is in a brilliant location; within 10 km you can find a fishing village (Cabo de Palos) complete with its own lighthouse, La Manga Club resort (with three 18 hole golf courses and a tennis academy), two nature reserves, safe beaches on the Mar Menor and more rugged, unspoilt beaches on the Mediterranean. There are good local shopping facilities, sight-seeing opportunities, many excellent restaurants and La Manga Strip is on the doorstep. An added attraction is that it is just 20 minutes from San Javier Airport which has direct flights from many UK airports. Within 200m is the Mar Menor (Little Sea). This is the largest salt water lagoon in Europe, with very gently slopping sandy beaches. The older and more developed area called Playa Honda which is approximately 1km to the west. Limited sports facilities, bars and shops are due to be added to Playa Paraiso in the next few years (mañana ........) as is the beach promenade. The development was well underway before it was discovered by the British, so although the blocks built later are about 50% British owned, the closer you get to Playa Honda the more Spanish it becomes. Playa Honda itself has several blocks of apartments which are either Spanish holiday homes or are owned by locals. Out of season it is very quiet. The climate is very pleasant with an average annual temperature of 17ºC and over 3000 hours of sunshine a year. The winters are very mild with temperatures only occasionally falling below 10ºC. Rain is supposedly rare here, although it nearly always seem to rain (mainly at night) whenever we visit. 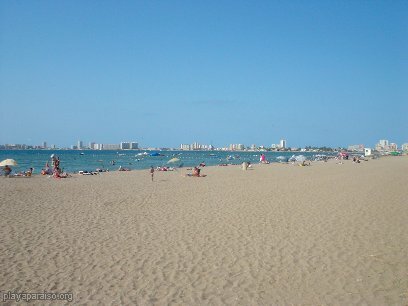 The beach on the Mar Menor is sandy and the sea is very shallow. This contributes to keeping the water temperature about 4º warmer than the Mediterranean. Areas are roped off in the summer to protect bathers from boats and jellyfish although these are generally harmless and the numbers have been reduced greatly in recent years. That is apart from the summer of 2006 when there were back with a vengeance! In the summer almost everybody on the beach will be Spanish and there is a very lively, friendly atmosphere. It is like another world with large encampments set up with gazebos, games tables, bars and bbqs. However, this is the only time of year that that there are life guards on duty and that the beach is cleaned on a regular basis. Towards Playa Honda there are several bars including one on the beach.